We're sure you're going to stick to every one of your New Year's resolutions. Except maybe the eating better one. And the being responsible with your money one. And probably the drinking less one. Applebee's new, month-long $2 cocktail deal definitely isn't going to help you cut down on drinking... but at least you'll be saving money. 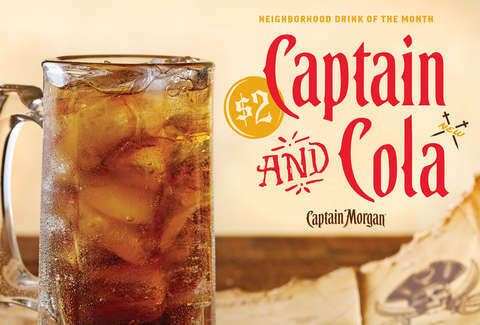 In the high tradition of serving $1 strawberry margaritas, Long Island ice teas, and Jolly Dolly cocktails, Applebee's has announced its latest "neighborhood drink of the month" for January: the Captain & Cola. It'll run you just $2 and uses Pepsi, so it's not technically a rum & Coke (though it's sure to resurface memories of rum & Cokes). The drink will even come in a 10-ounce mug -- a nice change from the flimsy plastic cups in those college flashbacks. See? New year, new you. The point is, you're going to be doing such a good job saving money that you can treat yourself to a drink. Or five for $10.